Discusses the Webroot SecureAnywhere console account, the Webroot WiFi Security account and best practices for how to set them up. WiFi Security users with an existing Webroot SecureAnywhere console account will not see their WiFi Security account in the SecureAnywhere console. However, if you have a Webroot SecureAnywhere console account, you should use the same credentials (email and password) to sign in to WiFi Security. And conversely, if you have already created a WiFi Security account and now want to access your SecureAnywhere console, use the WiFi Security credentials for the console. ﻿If you change your SecureAnywhere console account password, this will also change your WiFi Security password and vice versa. The credentials for WiFi Security are shared with the Webroot SecureAnywhere console. 1. 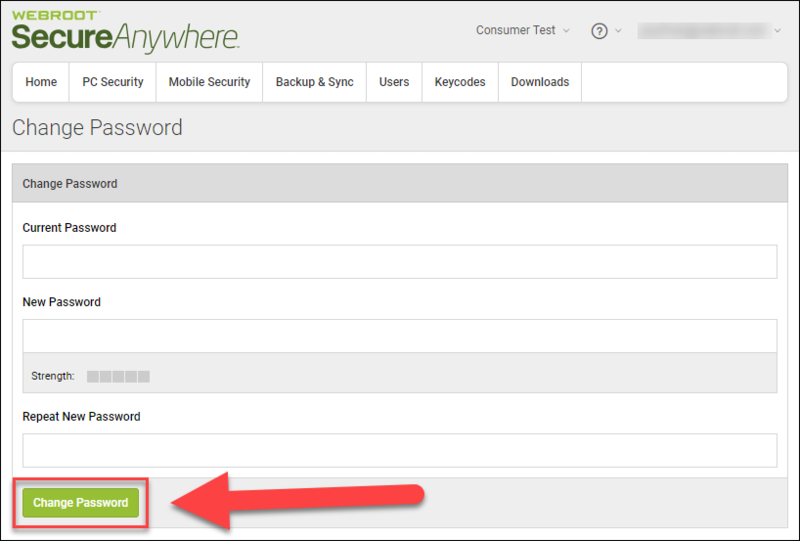 On the upper right hand side of the SecureAnywhere console, click your username and select Account Settings. 2. On the following screen, click the change password button to change both your SecureAnywhere console password and WiFi Security password. Please note that if you change your WiFi Security password directly on the app, as outlinedhere, this will change your SecureAnywhere console account password as well, assuming you have used the same credentials.